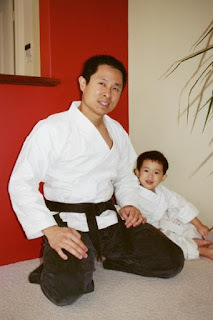 My son aged just under 3 years old tries on his first martial arts uniform while I look on - not really knowing what to do. 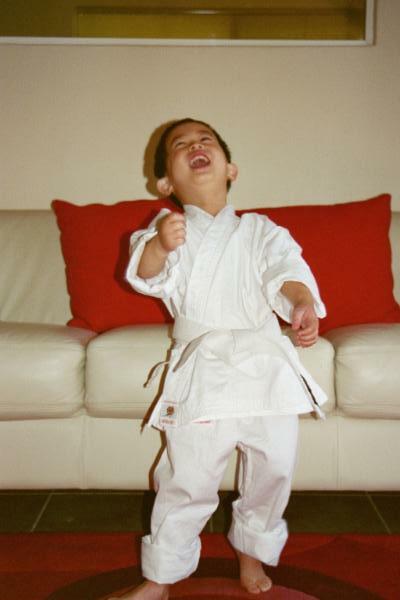 There are countries - I'm thinking China, Korea, and Japan - which start children in martial arts as early as 3 years old. The training provided is not like your normal child care activity. Children are made to train long and hard to establish movements that will ultimately make them proficient at high-level international sportive competitions. Uniforms make a great costume - much the same as the telly tubby costume we borrowed from the toy library. I fear that serious and rigorous training at that young age will rob a child of their youth - and should be embarked on with great care and deliberation. 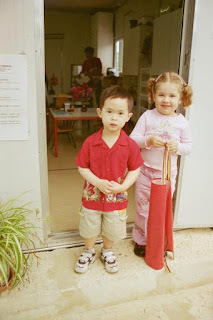 There are other programs like Suzuki Violin, or Montessori education which may be more nurturing, and might provide young parents with a value system or learning pedagogy which might help them raise their little children. 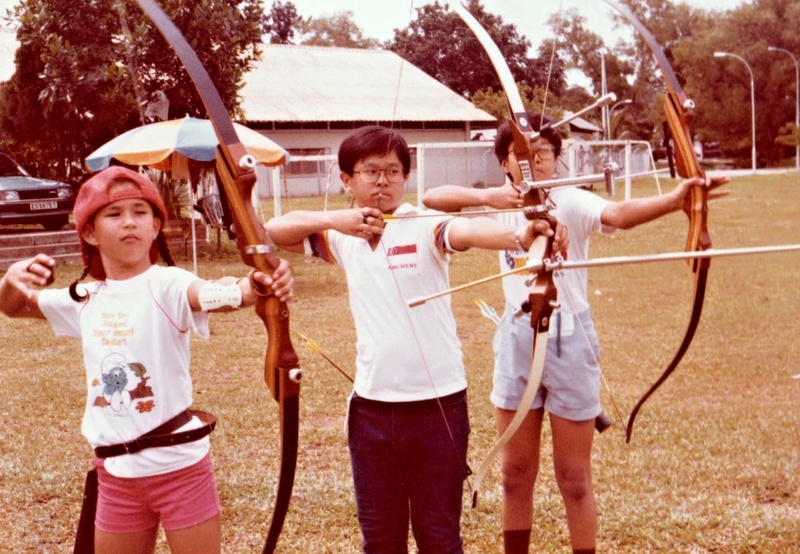 I started representing my country in Archery competitions, competing against adults when I was only 13 years old. 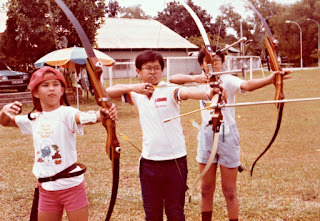 Working backwards from there means that I started my archery training from when I was 6 years old, and started competing when I was about 11 years old. From my experience as a young athlete, I would typically ask parents what their motivation and their goals of training are for their child at such a young age. I have no bias, if you know you want a social program for fun, that is fine. Or at the other end of the spectrum - if you have an indication that your child has some level of talent and your family has the right environment to support them, well, that's fantastic. My son starts violin. 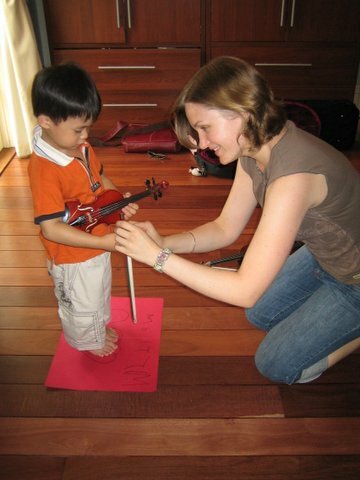 That's his work area he's standing on, and there's his wonderful violin teacher which has guided his every step on his musical path. My family chose to put my son aged 3 years and a bit into a Suzuki violin program because of his innate pitch and sense of rhythm. It was early days but we didn't have inflated expectations - our aim for Suzuki was to get him acquainted with a musical instrument and have the music that could accompany him for the rest of his life. After 12 years under the same teacher, he is a fairly solid musician, though we believe his plans are to not pursue it as an ATAR subject but continue with practice and activities as a nice bonus to his resume. Colin aged 15 years old demonstrating some martial art-y stuff in front of his school. I just didn't realise that no one really was that entertained except for the guys who were doing the demo with me. We were such geeks. I am grateful for simply having the opportunity. 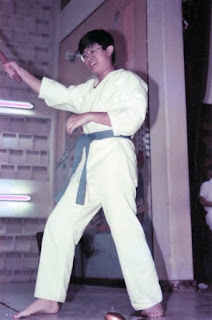 I myself started martial arts training when I was 13 years old - it was a passion of mine which I pursued of my own accord. It would be an activity that would see me practice an hour every day after school. It gave me a code. It gave me my fitness. And I am now a world leader in my chosen discipline. One of my first archery competitions - I nicked the national colours off my dad, who was a National representative, and who encouraged me through his own participation. For many years, I believed that 13 or 14 years old was the minimum age which I will accept pupils into my school. And for many years, I did that. Of the few children who did train with me, many of whom had the honour of not being treated as children but as adults in my program. There are good and bad points of that, but my intention was to train dedicated and serious practitioners through my system. This is the most compelling before and after photo I can show you. 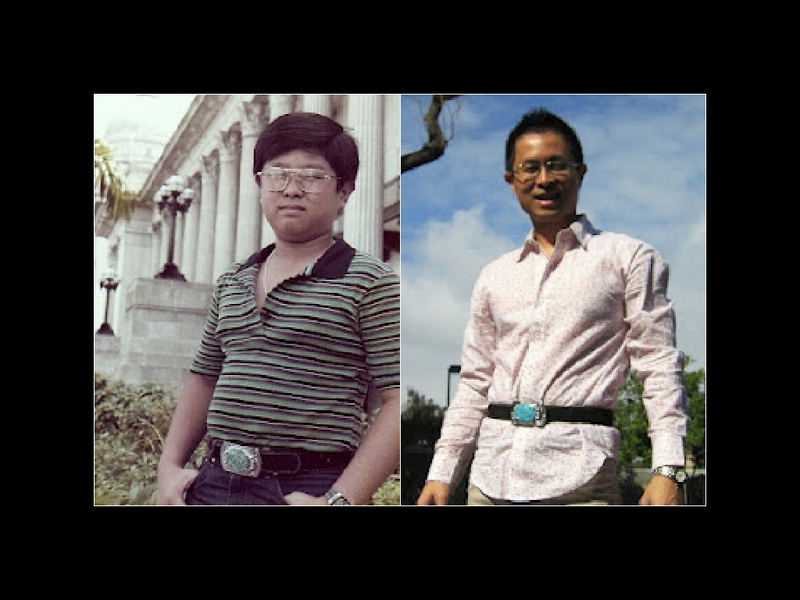 Left is me aged 11 years old before I embarked on a portion control diet and martial arts training. 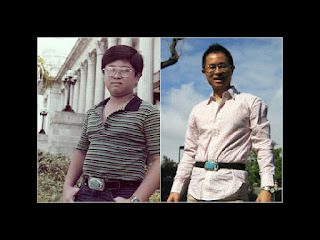 Right is of me aged 41 years old - after about thirty years of training. Martial arts training I credit with everything from helping me to keep fit, to stress relief, to being a good husband, a protector for the family, and a nice person. It is hands down the best all round training I have ever received in my life. Don't let me stop you from enrolling yourself or your child in any martial arts program!!! As an instructor, a father, and from my experience through the years as a board member of the various schools my children have attended, I am happy to start the school age child as young as 5+ years old in a martial arts training program. The caveat is that the child and you need to be ready to support the training environment in which we are creating. This includes a probation period like any other traditional martial arts school plus the ability for you to support our instruction on the floor. That however is not a pass for you to helicopter parent your child or contradict instruction or instructors. Please note for children that young, we are using a syllabus to train the most minimal gross motor skills - this is not the same syllabus as that used to train adolescents. I am proud of my son - he did a few years of Judo, not with my school. He also did a few months of self defence training with me. But it is not his passion, so I can only extend my invitation to him - I won't force him to do something for the sake of my own expectations, even if I know it'll be great for him. 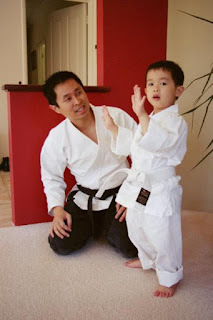 Last thoughts - there are many things you can teach your child even before they are old enough to get to a martial arts class. Look at the Tenets of Taekwondo - focusing just on the first three. It's not difficult for your child to emulate Courtesy if you only ever show generosity of spirit and good manners in your household and when you interact with others. Show your child how to have Integrity - by maintaining high moral values and ethical principles. And lastly, keep Persevering at activities that mean a lot to you and your family. These are three significant areas which you can share with your child - helping them become a good person without even stepping into a martial arts dojang.